Local artist Kelly Price in her artist studio at the Fayetteville Underground. Photo by Kat Wilson, 2010, digital print. Kat Wilson, a graduate student in the J. William Fulbright College of Arts and Sciences art department and a recipient of Contemporaries Honorable Mention, was recently featured in the Arkansas Arts Center's 53rd Annual Delta Exhibition and Number: Magazine, an independent journal of the arts. In her acclaimed Habitat Series, she juxtaposes everyday and exotic household furnishings in their natural surroundings. 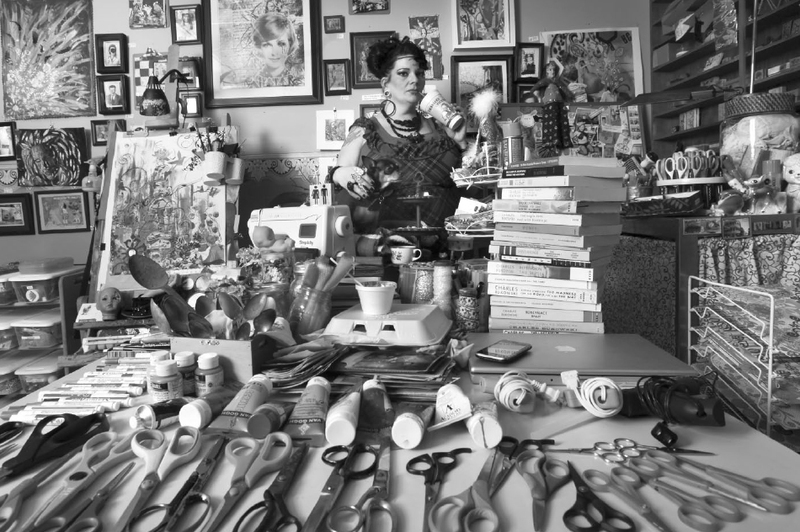 She and the sitters arrange the objects they love in the environment that defines them. “I’m exploiting these people and their stuff,” Wilson admits, and through this exploitation she enables them to express themselves completely, if only for a single moment in time. If Wilson were a subject of her own Habitat Series, she would be surrounded by BB guns, tennis rackets, angel wings, crutches, bowling pins, hair bleach, mounted foxes, Polaroid, and unsent love letters to Lady Gaga. Wilson’s work has been published both regionally and internationally, including pieces in the Los Angeles Times, the Arkansas Democrat Gazette, the Washington Post, Little Rock Monthly, and Communication Arts. Her exhibits have been featured in the Historic Arkansas Museum, the University of Central Arkansas, the University of Arkansas Fayetteville, the University of Nevada Reno, the Arkansas Arts Center, and the New York City Traveling Exhibit. She currently is a graduate assistant at the University of Arkansas and co-director of the Sugar Gallery in Bentonville.